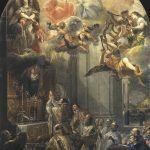 Don Quixotes of post-conciliardom – I komu to przeszkadzało? Some time ago I coined the phrase that post-conciliardom is not a specified period of time but a state of mind. Other encounters with the representatives of this trend confirm me in this conviction. It is not about the masses of people who attend the New Mass but about a peculiar mentality which is rooted in the minds of part of them. Persons who have experience in discussions with Catholics for whom the history of the Church is limited de facto to the Apostolic times and “the second Pentecost”, which was to be originated in the last council, may share this feeling. I write “de facto” because despite the fact that those people know that the Church existed between Constantine the Great and Vaticanum II, they have only a vague impression of it which is sometimes distorted. Conversations with such post-conciliar buddies are peculiar, often resemble hitting a wall with a head, and they may be accompanied by alternate laughter and crying: it is the most visible in the case of priests who, subjected to the seminary indoctrination in the spirit of “the Spring of the Church”, defend the falling ideal of post-conciliar reforms more fiercely. They try to undermine all the arguments with the spell “But the Council said…”, often proving their lack of knowledge of the conciliar documents and of the whole context of the deforms of the following decade. The vast majority of those people also have never experienced this what is defined as the “pre-conciliar period” – the Mass, the discipline, the character of such Catholicism, which they know only from what they have been taught by their grandparents or parents. It is an often practise that they even do not exploit the possibility to see the old rite: one of Oaza (a Polish youth Catholic movement connected with post-conciliar reforms) guys I know said that “it would be inconsistent with our charism”. 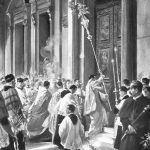 Such discussions usually tackle the leading notion of the “renewal”, namely the liturgy: it is obvious that everyone has contact with it and it is the most striking example of the changes introduced after Vaticanum II. In this matter the quarrels concern mainly the usage of Latin or orientation of the priest but those more disturbing concern the issue in which there should not be any misunderstandings, namely the faithfulness to the regulations and the spirit of the liturgy. When, on the basis of arguments, testimonies from the past or the regulations, one proves that post-conciliar buddies are wrong, then they accuse their interlocutors of lack of love and Phariseeism. One cannot escape it – if you do not distort the reality, you are heartless and terrorise everybody with the dead letter of the law. I persuade myself that all I say is as I say, neither more nor less, and I picture her in my imagination as I would have her to be, as well in beauty as in condition. (…) And let each say what he will. In this quotation Don Quixote reveals his thoughts of miss Dulcinea, his beloved whom he simply concocted and endowed her with wonderful virtues and noble birth, despite the fact that he “located” her in the neighbouring village where such a person could not live. The post-conciliar reform is similar – a real one, according to the resolutions of the last Council has never taken place but the knights errant of the post-conciliardom convinced themselves that it has and even it has been successful and bears good fruit. The fact that the conciliar documents is one world and the modern liturgy is a completely separate one does not really matter. These documents were just a kind of guidelines: everybody knows that the spirit of the Council guided everything and led us out of the dark ages of the Church to the bright future. May others say what they want to, I have imagined it exactly like that and I like it the way it is. If the facts are different, the facts must be changed. Is it worse than it has been? Sancho Panza, when he could not fulfil the order of his lord, namely to find this non-existent woman, he presented him a peasant girl, whose beauty and upbringing were far from the ideal, who was coming by, knowing that Don Quixote would explain himself this state of affairs with an intervention of a sorcerer. That is exactly what has happened and is still happening in the case of post-conciliar buddies, reality distorters on duty: in the Church there are problems but it is not the fault of the reforms but… Well, it is hard to say but definitely if the reforms had not been conducted, the situation would be much worse today. Just as the aforementioned hidalgo fed his fantasies with chivalry romances, post-conciliar buddies graze on the fields of obsolete and erroneous theories which supported errors such as turning the priest towards the people. And, although such people in their everyday lives use common sense, just as Don Quixote, whose reasoning in many affairs was admired, they similarly lose their minds in the most important matter for them: they perceive the post-conciliar reality completely different, despite the fact that the painful experiences suggest that windmills are not monsters and roadside inns are not castles where imprisoned princesses await their saviour.